I'm a freelance writer living in Perth. This October holidays we (along with half of Perth) hit the road in search of some warmer weather and a bit of relaxation. 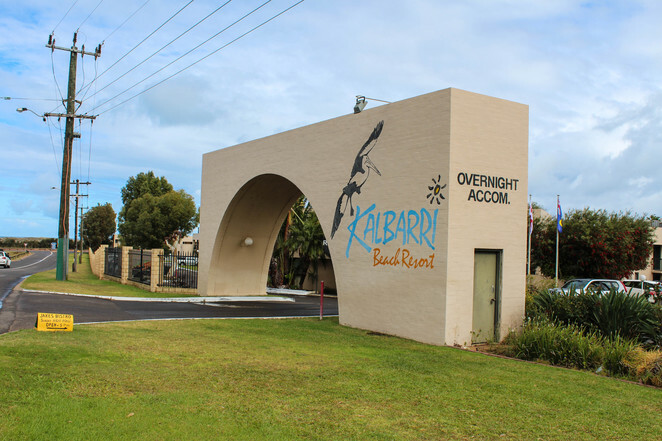 We got a special school holiday deal at Kalbarri Beach Resort so we packed up the car and off we went. Arriving in Kalbarri at 1:30pm (half an hour before our designated check in time) we thought we'd try our luck and see if we could check in early. The friendly staff at reception had no problem with this - our room was ready and keys already waiting in the pile for us. We followed the map to our unit, which was on the second floor. Not so great for packing and unpacking the car but perfect, it turned out, for watching the resort movies on movie night! 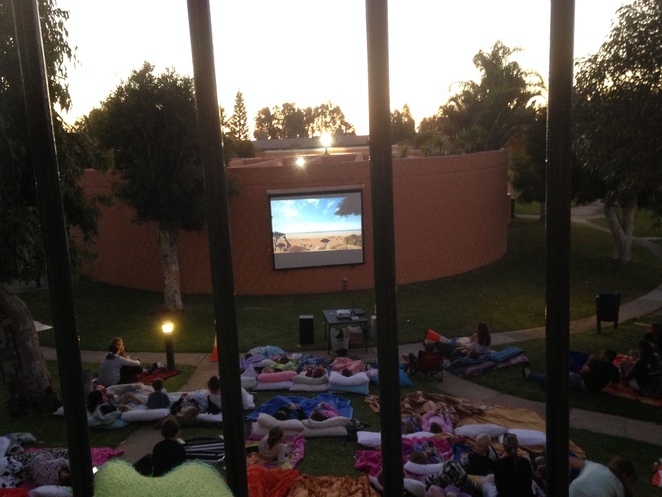 Movie night for the kids - from our balcony. Our unit was clean and had everything we needed. The kids' bedroom had a bunk bed and a single bed so if you have 3 kids you still only need a two-bedroom unit. Between the two bedrooms was the bathroom. No bath, but a decent sized shower and very clean. The kitchen was definitely on the small side when two adults are trying to move around in it but well equipped to cook your own meals. That's if you feel like cooking - if not the resort has their own restaurant within the grounds or there are a few other cafes nearby. The living area had table and chairs as well as sofas and a coffee table. The TV had all the usual channels as well as six Foxtel channels. There was a small laundry sink hidden away in a cupboard with a clothes airer. Upstairs units have a balcony and downstairs units have a small alcove, all with plastic tables and chairs where you can sit and enjoy the warm sunshine or watch the kids play on one of the two playgrounds within the resort. Speaking of kids... this place is great for the kids! Not only do they have movie nights and play equipment as I've already mentioned, there are also kids activities most mornings of the school holidays. These run between 9am and 10am and the kid aged 3-10 get to do cool activities such as making bead jewellery. The pool area is also designed really well. The pool has 3 areas - a toddler's section, a wading pool for slightly bigger kids and a 25m lap pool with 1.8m depth in the middle for older kids and adults. Also within the pool area are barbecues, a giant chess set, a games room with a table tennis table and arcade games and 3 spas. There are sun lounges and plenty of other chairs for the adults to sit in and read a book or just soak up the sun while the kids swim and play. If you are into sports there tennis and volleyball courts to the rear of the resort. All this without even stepping foot outside the resort! Of course, there are many other things to do in Kalbarri once you do venture out of the resort... but that's for another article!